Pushcard Prize winner and teaching artist Emmanuel Oppong-Yeboah. Photo by Tom Kaszuba. 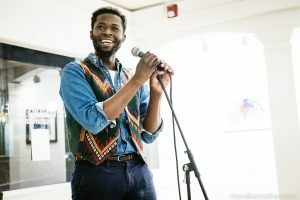 Emmanuel Oppong-Yeboah is a Ghanaian American poet living out the diaspora in Boston. He is both Black & alive. Emmanuel is the reviews editor for Winter Tangerine and an associate editor for Pizza Pi Press. This year Emmanuel will begin teaching 11th grade English at Cambridge Rindge and Latin School; for this, he is equal parts terrified and excited. When not kicking it with juniors, Emmanuel works as an instructor at the Boston-based nonprofit Grubstreet, and has previously served as a teaching artist at organizations such as the Massachusetts Literary Education and Performance Collective, the Cambridge Arts Council, Northeastern University, and the Institute of Contemporary Art, Boston. Emmanuel is a recent recipient of the Pushcart Prize (XLIII) and you can read his work in publications such as the Hartford Courant, Bird’s Thumb, Narrative Northeast, Kweli Journal, and Platypus Press. In his free time he enjoys hot carbs, brightly colored chapbooks, and the long sigh at the end of a good book.